The sweet potato (Ipomoea batatas) is a dicotyledonous plant that belongs to the family Convolvulaceae. Its large, starchy, sweet tasting tuberous roots are an important root vegetable (Purseglove, 1991; Woolfe, 1992). The young leaves and shoots are sometimes eaten as greens. Of the approximately 50 genera and more than 1,000 species of Convolvulaceae, I. batatas is the only crop plant of major importance – some others are used locally, but many are actually poisonous. The sweet potato is only distantly related to the potato (Solanum tuberosum). The softer, orange variety is commonly marketed as a "yam" in parts of North America, a practice possibly intended to differentiate it from the firmer, white variety. The sweet potato is very distinct from the actual yam, which is native to Africa and Asia and belongs to the monocot family Dioscoreaceae. To prevent confusion, the United States Department of Agriculture requires that sweet potatoes labeled as "yams" also be labeled as "sweet potatoes". The genus Ipomoea that contains the sweet potato also includes several garden flowers called morning glories, though that term is not usually extended to Ipomoea batatas. 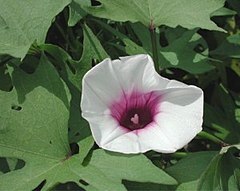 Some cultivars of Ipomoea batatas are grown as ornamental plants; the name "tuberous morning glory" may be used in a horticultural context. This plant is a herbaceous perennial vine, bearing alternate heart-shaped or palmately lobed leaves and medium-sized sympetalous flowers. The edible tuberous root is long and tapered, with a smooth skin whose colour ranges between red, purple, brown and white. Its flesh ranges from white through yellow, orange, and purple. Ipomoea batatas, Poir. (Batatas edulis, Choisy). Sweet Potato. Lvs. ovate-cordate, usually angular or lobed, variable, petioled: peduncles equaling or exceeding the petioles, several-fld. ; corolla 1-2 in. wide. Origin probably from I. fastigiata of Trop. Amer. (I. platanifolia. R. & S.).—Largely cult, in many varieties for its edible tubers. See Sweet Potato. The plant does not tolerate frost. It grows best at an average temperature of 24 °C °F , abundant sunshine and warm nights. Annual rainfalls of 750–1000 mm are considered most suitable, with a minimum of 500 mm in the growing season. The crop is sensitive to drought at the tuber initiation stage 50–60 days after planting and is not tolerant to water-logging, as it may cause tuber rots and reduce growth of storage roots if aeration is poor (Ahn, 1993). Under optimal conditions of 85 to 90% relative humidity at 13 to 16 C, sweet potatoes can keep for six months. Colder temperatures injure the roots. w:Sweet potato. Some of the material on this page may be from Wikipedia, under the Creative Commons license. This page was last modified on 25 March 2010, at 20:12.